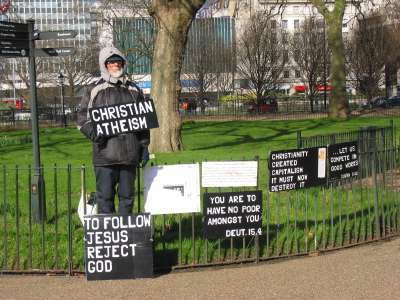 He didn't speak, though did spend some time staking out a corner with his eclectic collection of signs and printed materials. 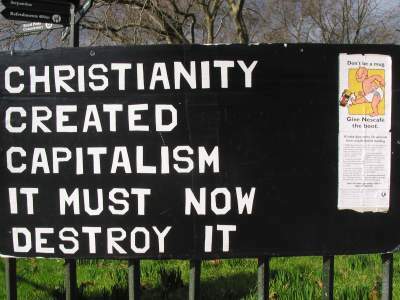 For some reason, nobody seems to have gone up to him and asked about the finer points of Christian Atheism. A bit further on, a chap in a baseball hat was either waving or threatening to burn an American flag; a crowd had gathered around him and were remonstrating vigorously with him. 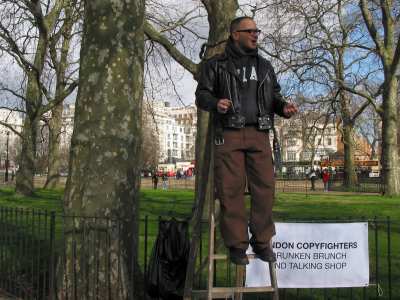 Not far from there, Cory Doctorow and his posse of copyright-policy troublemakers had set up and addressed the crowd on the evils of the broadcast flag and WIPO treaties.